We're looking at the Moon Snails, over 250 species in the Naticidae family. They can be found all over the world, from intertidal beaches to deep sea mud and from pole to pole. Most species prefer the tropics, though. They range hugely in size, from tiny ones with a shell some 1 cm (0.4 in) long to monsters with shells 15 cm (6 in) in length. It's always best to measure the shell when you're dealing with snails because the fleshy bit can stretch and retract to all sorts of lengths. This is never more true than in Moon Snails! But they can also squash themselves up until they look like a horrible snail cake with a shell on top. It's baffling to look at. Some of them are a complete mess, like they wandered through a plate of salt and are paying the price slowly and horrifically. Strangely enough, most Moon Snails can in fact retract their entire body into their shell and shut the door with an operculum. A few species can't. They have such a small, thin shell that it's simply embedded in their flesh and can't really do anything useful any more. But for most of them, the shell remains thick and protective even when it looks like there's far too much snail to fit inside. 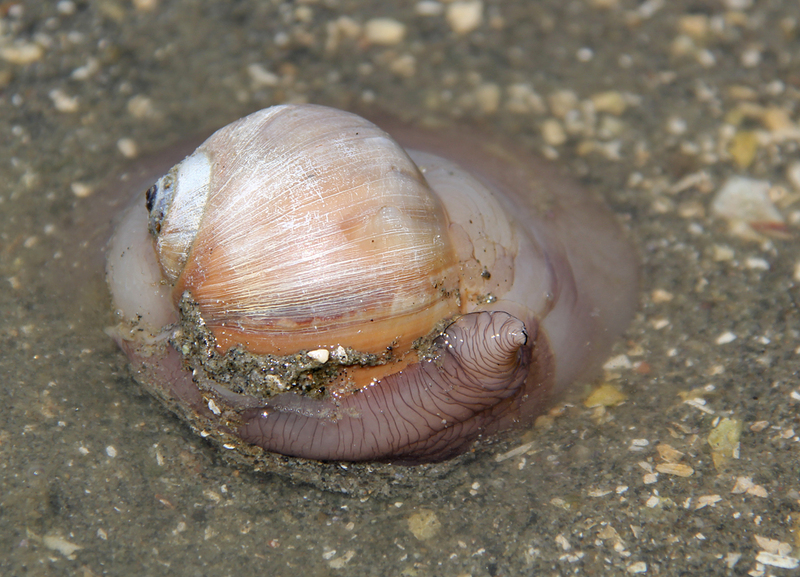 There are two big reasons why Moon Snails appear so incredibly fleshy. One is that their mantle actually covers parts of the shell in large flaps. These flaps can fit inside the shell too, but it does make it look like the snail is bulging and bursting out of the shell. The second thing is that, well, Moon Snails are bulging and bursting out of their shell! They absorb sea water to expand their body. If a predator comes around when they're in this state they'll have to release all that water before they can escape into their shell. 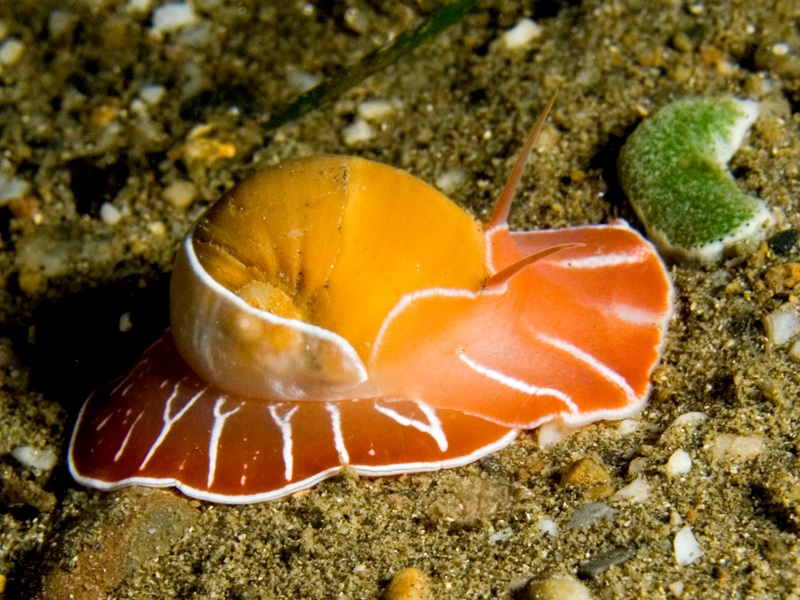 These strange characteristics allow Moon Snails to burrow beneath the surface of soft substrate. The mantle flaps reduce friction and lets them bulldoze their way through while the weird bulging helps them displace sand and mud. 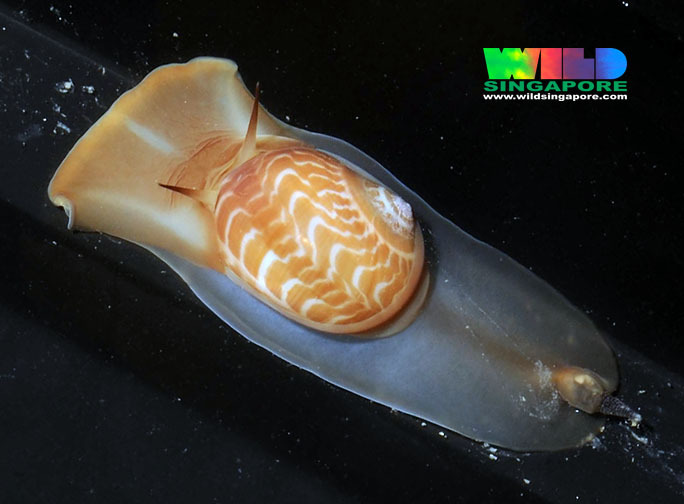 Moon Snails usually hunt for food at night and hide during the day. When their tummy rumbles they go out and look for something to eat. Usually a tasty bivalve which can't get away fast enough. 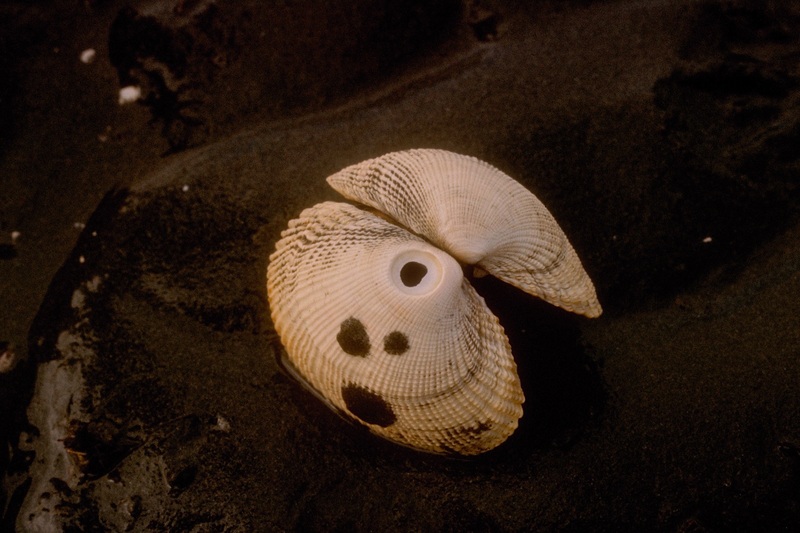 When they find it, the Moon Snail wraps itself around the bivalve. 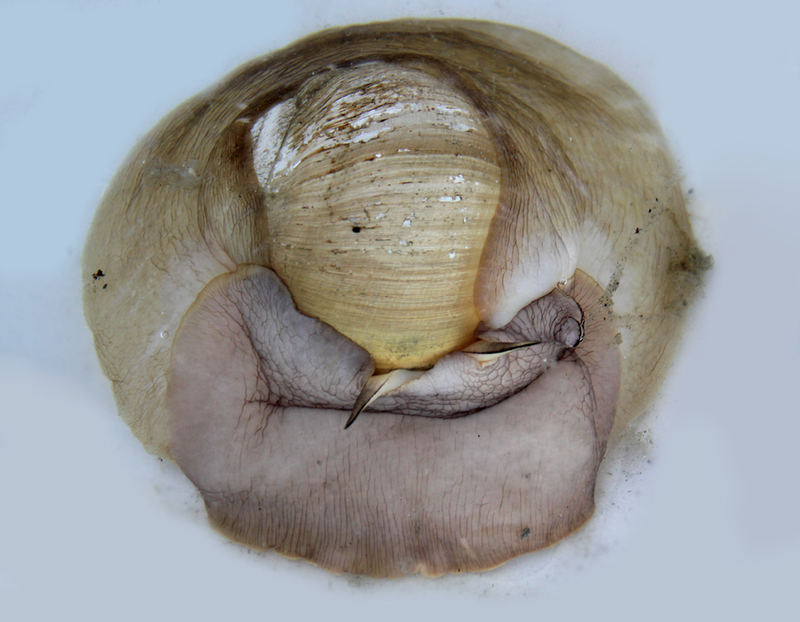 Sometimes it will simply stay like this until the bivalve gets tired and opens its shell. 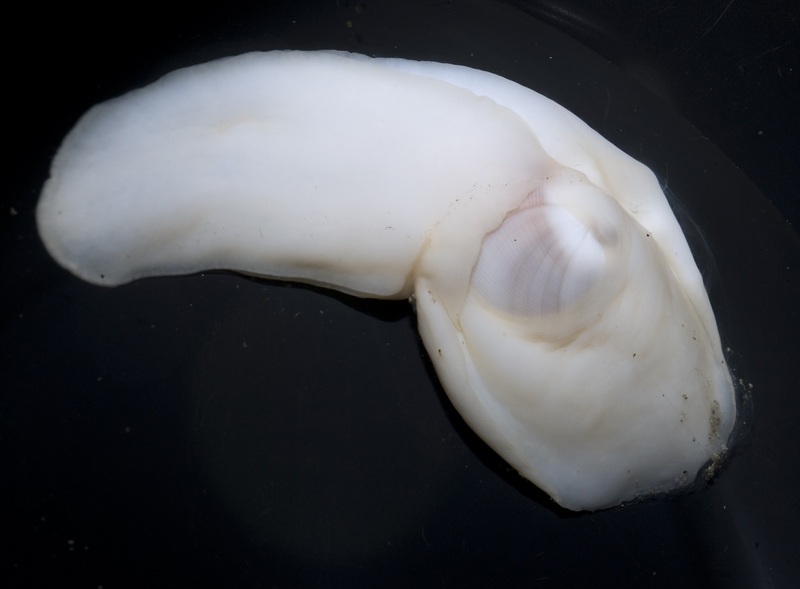 Then the Moon Snail can push its proboscis in and feed. 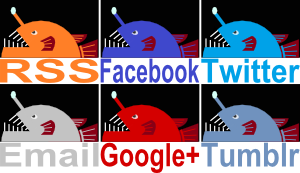 If that doesn't work, the Moon Snail will have to pick up tools and do a bit of carpentry. First they shift the bivalve into position. 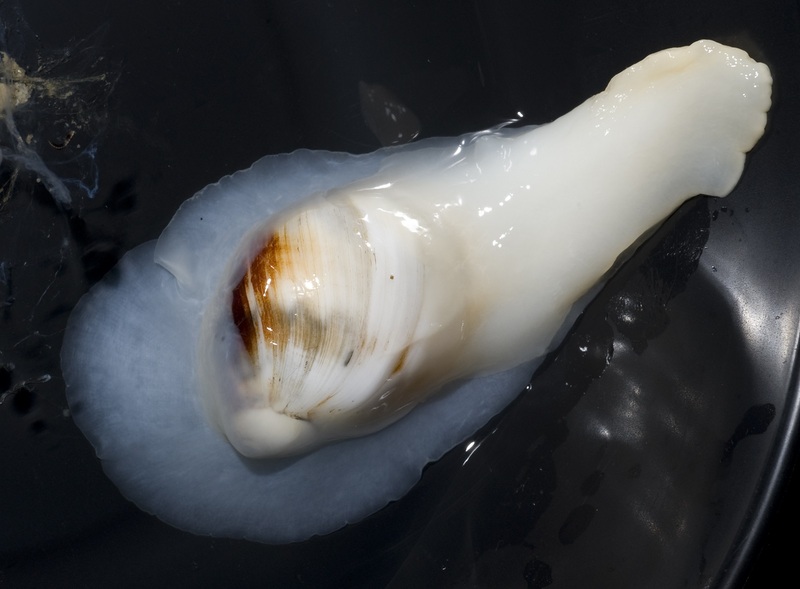 Then, with an acid secretion to soften things up, they use their tough radula to bore a neat hole in the bivalve's shell. Now, at last, they can get in and eat. It looks like even crabs are finding it difficult to believe that a snail could be a predatory meat-eater. I guess it isn't just me after all! After all this bulldozing, digging and boring it's time for a gentler craft. Moon Snails lay thousands of tiny eggs which they embed within a mixture of mucus and sand. 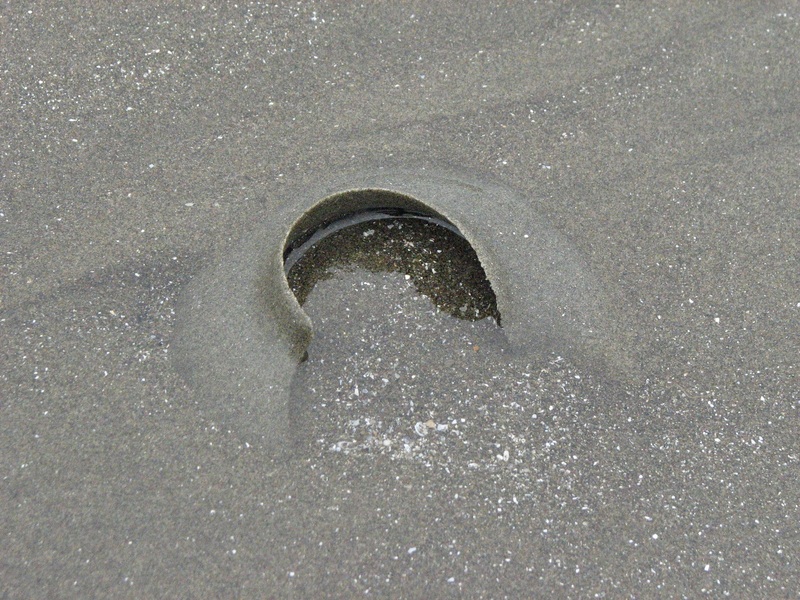 When the mucus dries up, you end up with a structure called a sand collar. It's a near full circle of material that feels a bit like plastic. The snail that made it could comfortably sit right in the middle and it's packed full of unhatched eggs. The whole thing disintegrates as the larval snails hatch and take on the plankton lifestyle before they're big enough to start digging and boring holes in other people's shells. What I really like about the sand collars is they look like a shard of pottery sitting there on the beach. 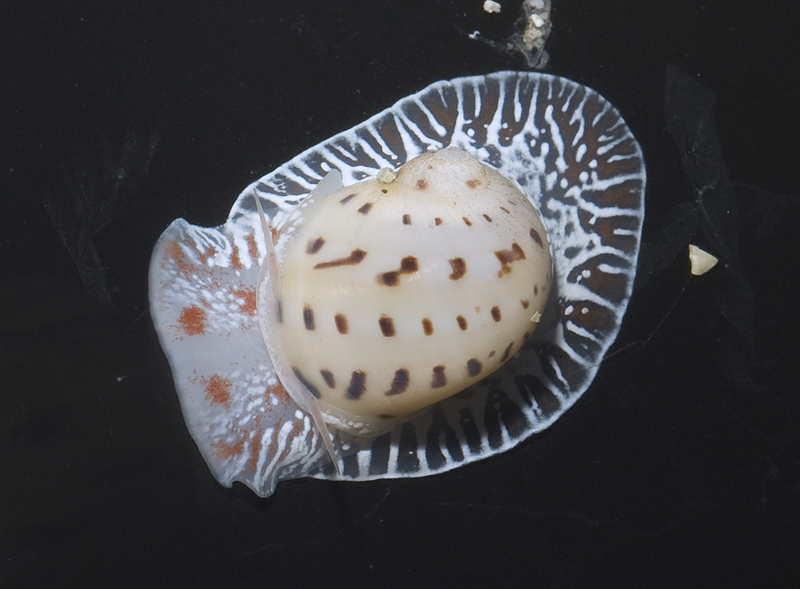 Also, when Moon Snails die their empty shells are a favourite among hermit crabs. Carpentry, pottery and architecture? Moon Snails are clearly here for all your household needs! 'Zebra' for something orange and white and 'oval' for something not even vaugely resembling an oval??? Who comes up with these names? That said, these are some amazingly pretty snails! @Esther: I think for some of them it's arguable whether they look even vaguely like a snail! Glad you like their looks so much! @Porakiya Draekojin: Yeah, they should start some crafting classes! Most of these pictures look like the aftermath of dropping one from a significant height. SPLAT. True! Maybe that's why they're such successful hunters. They're basically mimicking corpses!